Old Tales, New Approaches“Once Again Upon a Time” revisits old tales, adding new twists, and also introduces the reader to entirely fresh and innovative concepts. While I certainly enjoyed the previous anthology by Talaria Press, “Quests and Answers”, I feel that the authors outdid themselves here. Ranging from charming little stories like "To Bee or Not to Bee", to dramatic retellings of fairy tale classics such as in "Prussia 1735", or the hard sci-fi of "Aurora", “Once Again” is a wonderful and entertaining collection. Like its description suggests, “Once Again” is certainly a collection of fairy tales, but upgraded and modernized for grownups. And in so doing, the talented writers of Talaria Press have managed to make them just as enjoyable and as enthralling as the stories that we listened to when we were little. Title: Once More Upon A TimeAuthors: Ren Cummins, H. L. Reasby, Garth Reasby & Quiana KirklandPublisher: Talaria PressReviewed By: Arlena DeanRating: 4.5Review:"Once More Upon A Time" by Ren Cummins, H. L. Reasby, Garth Reasby & Quiana KirklandBook Description...."The founders of Talaria Press come together for a follow-up to the "Quests & Answers" anthology with this new collection of short stories and novellas inspired by classic fairy tales and fables, and even a few all new contributions to the genre. With referential and exciting tie-ins to their existing titles, such as "It's My Nature" by Garth Reasby or "Reaper's Breath" by Ren Cummins, fans of the books will be thrilled to see new facets to the characters and settings they have grown to love. And with new stories like "To Bee or Not to Bee" by Quiana Kirkland and the sci fi thriller "Aurora" by H. L. Reasby, readers will be welcomed into even more tales from these successful authors. 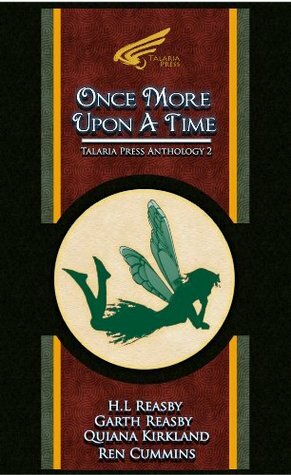 "Once More Upon A Time" - a brand new collection of newly envisioned fairy tales for young and old alike! Once More Upon A Time contains the following titles: The Bamboo Princess, by Ren Cummins Prussia, 1735, by H. L. Reasby It's My Nature, by Garth Reasby Reaper's Breath, by Ren Cummins To Bee or Not to Bee, by Quiana Kirkland Aurora, by H. L. Reasby The Rat King, by Ren Cummins This all-new collection also contains special samples from three of Talaria Press' best selling novels - no Talaria Press fan's collection would be complete without this anthology! "What I liked about this novel....These were a groups of some beautifully arranged anthologies by this group of authors. These authors really worked it going the readers something different in there thinking. I wasn't sure when I started reading just what I would get but as I got into these stories I found these collection were a updated version of short stories and were very interesting to read. My favorite were the updated retellings fairy tale classics and fables that were retold in such an interesting way. I thought all of this was well presented collections that was definitely an enjoyable good read. Would I recommend "Once More Upon A Time?" YES! H.L. Reasby Garth Reasby Quiana Kirkland Ren Cummins - Though born in Illinois, Heather spent most of her life in the Phoenix/Scottsdale metropolitan area of Arizona. Now residing in the beautiful Pacific Northwest (literally moving from one extreme to the another) she is married to Garth Patrick Reasby, who is a talented artist and writer in his own right.